The last few weeks my family has had the privilege to work with Peaceable Kingdom: A MindWare Brand on reviewing five of their games. The games this company provides are very educational and super-fun to play together as a family. During my review I had the chance to give the following games a shot. You can also check out what my family and I thought about each game by clicking each title. A mischievous mouse has snuck into the cats’ garden and stolen their bowl of delicious treats! To get their treats back, the four cats must surround the mouse before he escapes under the garden fence. 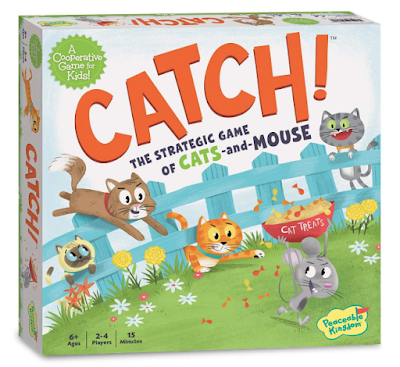 Players will need to use teamwork and strategy to catch the mouse and win the game. INCLUDES: 1 game board, 4 cat movers, 1 mouse mover, 1 cat die, 1 mouse die and instructions. Lemonade for sale! Work as a team to make and serve enough cups of lemonade to fill your money jar. Shake up the dice and roll for the match! Get the ingredients needed to serve a customer and add a few quarters to the money jar. Miss the match and it’s a sour lemon for the team. Cooperate to win! No reading required. INCLUDES: 5 dice, 1 plastic cup, 12 customer cards, 4 sour lemon tokens, 12 quarter tokens, 1 recipe card, 1 money card, and instructions. All aboard! 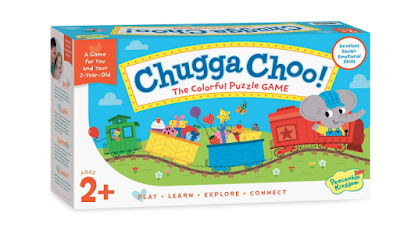 Chugga Choo is a color-learning game and puzzle that’s perfect for the littlest engineers. Players match boxcars by color and choose wooden cargo tiles to fit in the empty boxcars. Each train is completed by adding a little caboose. Learn color-matching, spatial recognition, puzzle problem-solving and fine-motor skills. INCLUDES: 4 engine puzzle cards, 12 boxcar puzzle cards, 12 caboose puzzle cards, 12 cargo tiles, parent guide and instructions. 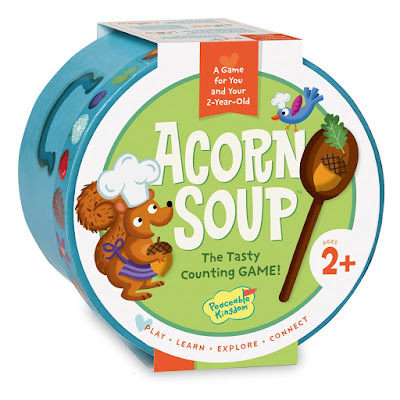 Making Acorn Soup is easy as 1-2-3! The round box bottom doubles as a bowl, which contains wooden ingredients and a sturdy wooden spoon for mixing and stirring. Simple recipe cards teach toddlers to identify the ingredients and count as they cook. Mix, stir, eat and play together! Counting, pretend play, sorting, fine-motor skills are benefits of this fun, interactive game! INCLUDES: 8 recipe cards, 24 ingredient tiles, 1 wooden spoon, parent guide and instructions. Someone has stolen the Queen’s treasures and has dropped them in the castle’s twisty maze. Luckily, the trusty gnomes are here to help! 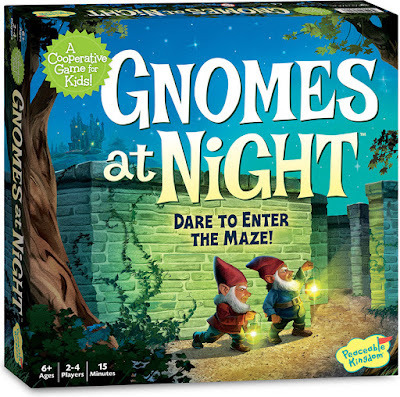 Players work together to maneuver the magnetic gnome movers around the mazes to collect all the treasures before time runs out. Use communication, strategy and quick thinking to find the treasures and win the game! INCLUDES: 4 game boards, 22 playing cards, 2 game board holders, 2 magnetic gnome movers, 1 sand timer and instructions. Now for the AWESOME part! Peaceable Kingdom: A MindWare Brand, is offering 1 Lucky Winner all the exact games I had the chance to review! Good Luck! Disclosure: I was compensated for this post with a product to review by a PR agency or company for my honest opinion. Regardless, I only recommend products or services I use or would use personally and believe will be good for my readers. Your opinions may vary from my opinions. You can also go here and read my PR and Disclosure Polices.